68 • RV PRO • March 2019 rv-pro.com O R I G I N A L E Q U I P M E N T That robust and deep product offering pays off in the after- market as well. Miller notes that some estimates indicate that about 90 percent of RVers park their rigs for the winter, so a furnace doesn't get much use over a season. However, there can be a lot of wear and tear on the air conditioner. And, that's only part of the story. "An AC is getting used by a vast majority of all RVers all season long," he says. "However, there are also more people wanting to add air conditioners. Maybe it's a sport-utility-type of fifth wheel and they want to put one in the garage. There may be a vent back there and it's prewired and ready to go. Or, the same with a travel trailer; they may have air in the living quarters, but just a fan in the bedroom, and they want to add a second air-conditioner in the bedroom." 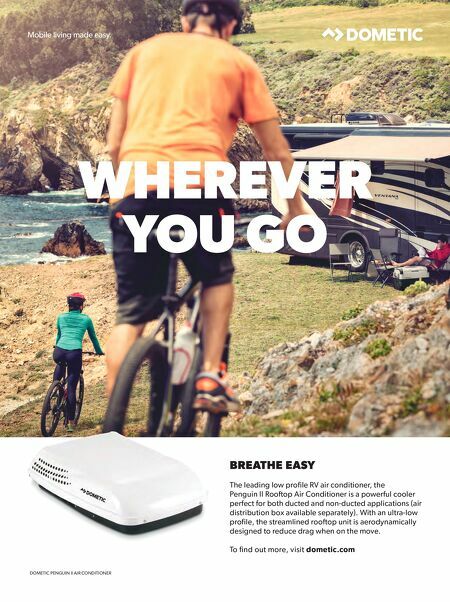 Along with offering multiple lines of air conditioning units to fit various size and profile needs, Miller says the fact that Dometic's vent fans are modular and upgradable can be a real boon for RV owners. "The tech can get in there, take out a few screws, pull the Dometic worker Tina Puzynski grabs a needed part from the company's massive parts warehouse in Elkhart. Dometic believes in deeply stocking parts so it can meet the needs of its original equipment and aftermarket customers. Dometic's Blizzard NXT is a 15,000- BTU rooftop A/C available for ducted or non- ducted application featuring a sleek and aerodynamic design. Dometic furnaces are available in 12,000- or 40,000-BTU configurations and operate of LP or natural gas. assembly and replace it with an upgrade without ever having to touch the rubber roof or do any- thing that could lead to leakage," he says. 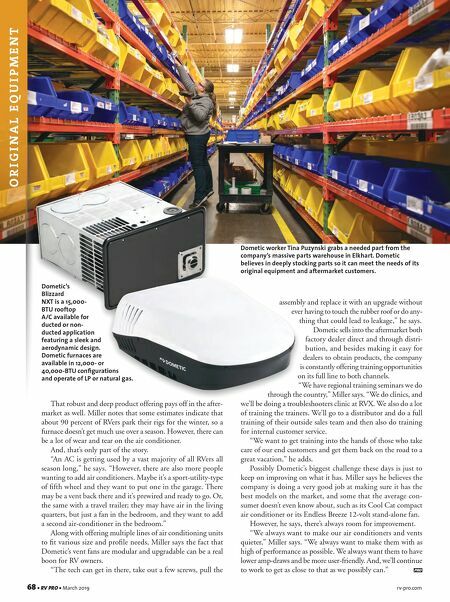 Dometic sells into the aftermarket both factory dealer direct and through distri- bution, and besides making it easy for dealers to obtain products, the company is constantly offering training opportunities on its full line to both channels. "We have regional training seminars we do through the country," Miller says. "We do clinics, and we'll be doing a troubleshooters clinic at RVX. We also do a lot of training the trainers. We'll go to a distributor and do a full training of their outside sales team and then also do training for internal customer service. "We want to get training into the hands of those who take care of our end customers and get them back on the road to a great vacation," he adds. Possibly Dometic's biggest challenge these days is just to keep on improving on what it has. Miller says he believes the company is doing a very good job at making sure it has the best models on the market, and some that the average con- sumer doesn't even know about, such as its Cool Cat compact air conditioner or its Endless Breeze 12-volt stand-alone fan. However, he says, there's always room for improvement. "We always want to make our air conditioners and vents quieter," Miller says. "We always want to make them with as high of performance as possible. We always want them to have lower amp-draws and be more user-friendly. And, we'll continue to work to get as close to that as we possibly can."